How would you like to have a sensational Father's Day? 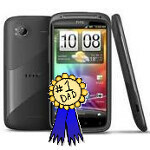 You could by winning one of ten HTC Sensation 4G models being given away by T-Mobile for Father's Day. The carrier let the cat out of the bag via a tweet, but did not offer any more information on the giveaway except to add that more details will be forthcoming tomorrow (that is Monday for those on the West Coast). If for some reason you are not familiar with the handset, the HTC Sensation 4G is one of the hottest handsets globally, in the same company as the Samsung Galaxy S II. A 4.3 inch qHD Super LCD display offers sharp and clear text and video and the HTC Sensation 4G is powered by a dual-core Qualcomm MSM8260 1.2GHz processor with 768MB of RAM aboard. Android 2.3 is under the hood. An 8MP camera is on the back while a.3MP VGA shooter is on the front for self-portraits and video chats. And of course, the handset is HSPA+ enabled. With those hot specs, the HTC Sensation 4G will make a great Father's Day present. And if you can't win it for free from T-Mobile, perhaps you can convince your family to pick one up for Father's Day. As we have reported, the phone will launch from T-Mobile on Wednesday at a price of $199.99 following a $50 mail-in-rebate and with a signed 2-year contract. Don't forget to keep checking in with us on Monday. Hopefully, T-Mobile will remember to release the rules of the HTC Sensation 4G giveaway! i want to win htc. mobile ilke htc mobile very much. i like its apperiance.